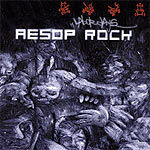 Re-issued in 2011 by Aesop Rock on his Block, Block, Chop label. This is one of the greatest hip hop albums of all time! You need this! 1, 6, 9, 10 produced by Aesop Rock. 2, 3, 4, 5, 7, 11, 12, 13, 14 produced by Blockhead. 8 produced by Omega One. Vocals by Aesop Rock. All scratches by Omega One. All songs recorded by Aesop Rock at the house. All songs mixed by Cryptic at da Crypt. All songs mastered by Emily Lazar at the Lodge.Publishing: Aesop Rock Music.